I’m sharing this century egg congee today because comfort food from China is all I’ve been craving lately. In my previous newsletter I announced that we’re moving to New York. I’ve traveled between Austin and New York multiple times this month and spent most of my time furnishing our apartment. I’m also doing some serious downsizing right now so we won’t overcrowd our small apartment in New York. Thanks to all of you who sent me best wishes via email. I’ve also received quite a few questions as to why I’m moving. Long answer short, I missed the buzz of city life and the cultural diversity after moving away from Beijing. I’ve traveled to New York a couple of times in the past three years and it always felt like home. I enjoy visiting museums and art galleries, discovering hole-in-the-wall restaurants run by people from all over the world, meeting up with friends, and shopping for groceries on foot. I’ll continue to share some updates on our moving here and there. But let’s dive into the topic of food for now! Between packing up and settling into my new home, I’m super behind on recipe development and have somehow been craving comfort food like crazy. That’s why I want to share my favorite dish from when I was growing up. 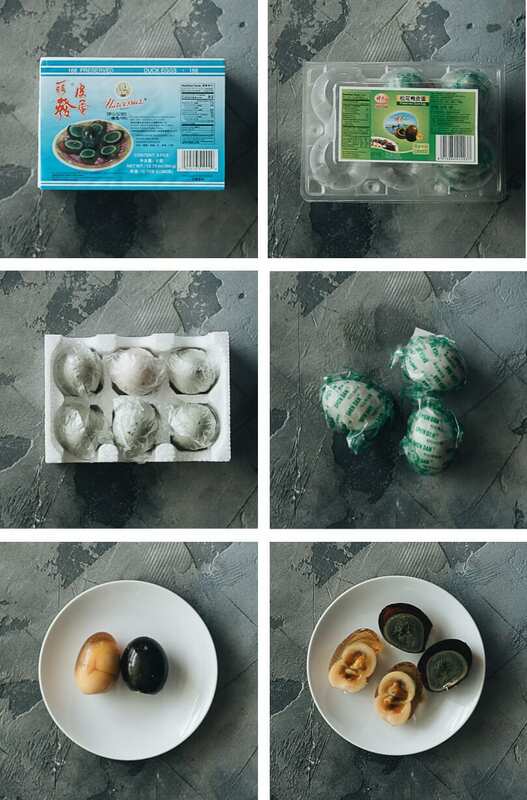 I’ve talked about century eggs in a previous post. You can get more information on how to buy and store them in that post. 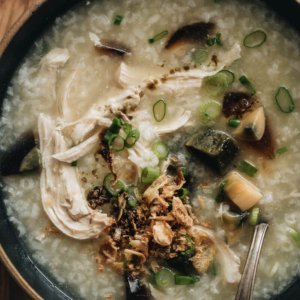 Growing up in northern China, most of the century egg congee I had was made with pork strips. However, I really love the version served at Jin Ding Xuan (金鼎轩), a famous Cantonese dim sum chain that I visit frequently. Their congee is made with shredded chicken instead. I decided to make the chicken version in this recipe. It’s easier to make than the pork version and I love its taste. If you prefer the pork version, what you can do is to cook the congee first. Then use the method documented in my hot and sour soup recipe, to add the pork at the end of cooking. It halves the cooking time. It’s low maintenance. You can set the timer and forget about it. The congee will come out with a better texture. Due to the high pressure, you can get a starchier and creamier texture without soaking the rice. You can use frozen chicken without defrosting it. Of course, you can still cook this dish without a pressure cooker. I’ve included both methods in the recipe below. The reason I love the chicken version is that it requires less prep time. Unlike the pork version, which requires you to cut and marinate the meat, the chicken version doesn’t require any of that prep work. I simply add the whole piece of chicken (both breasts and thighs work) into the pot with the rest of the ingredients, and everything will be cooked at the same time. I especially love the fact that I can use frozen chicken without defrosting it. Although you can add the century eggs at the early stage of cooking, I prefer to add them at the end. It preserves the egg texture better, especially when I use century eggs that have runny yolks. You can add the eggs in the last 10 to 15 minutes of cooking if you cook the dish on the stovetop, so the eggs will melt into the congee a bit. In either case, it doesn’t really affect the taste of the congee. Some street vendors use chopped cilantro on the congee. But personally I like to add thin sliced green onion. One thing I miss most from the Chinese version is that they use salty crispy fried chips (made from wheat flour) on top of the congee. It adds such a great texture. I’ve never seen them in our local Asian market so I used some fried shallots instead. You can totally skip this step or use some toasted sesame seeds, as well. But a drizzle of toasted sesame oil is always a must! That’s it! I hope you enjoy the dish. To make this dish gluten-free, use dry sherry instead of Shaoxing wine. Add the rice into a medium-sized bowl and water to cover. Gently rinse the rice a few times with your fingers and drain. Repeat one to two more times. Drain well. Combine the rice, stock, chicken breast, Shaoxing wine, and ginger into your Instant Pot. Set it to cook at high pressure for 15 minutes. Once done, release the pressure naturally. Note, do not use fast release because the congee is starchy and might cause the valve to clog. Once the pressure is released, uncover the pot, remove the chicken and place it onto a plate. Shred it with two forks. Add the century eggs, green onion, sesame oil (if using), and the shredded chicken to the pot. Stir to mix well. Taste the congee and add salt if needed. Combine the rice, stock, and 2 cups of water in a big pot. Cook over medium-high heat until bringing to a simmer. Turn to low heat. Cover the pot and leave a finger-wide a gap between the lid and the edge of the pot, to allow more steam to escape and prevent the congee from spilling or boiling over. Simmer for 25 minutes. Add the chicken breast. Cook for another 15 minutes. Remove the chicken breast and place it onto a plate. 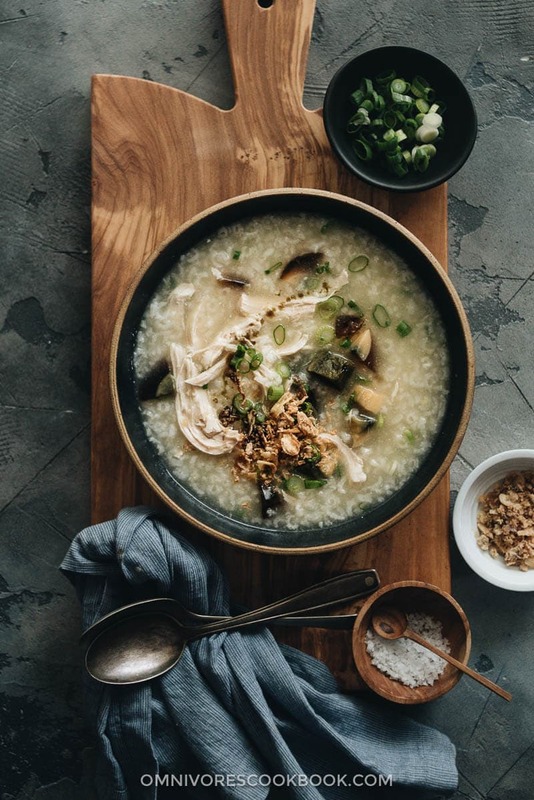 If the congee has reached the desired texture when the chicken breast is done, turn off the heat. Transfer the chicken onto a plate and shred it with two forks. 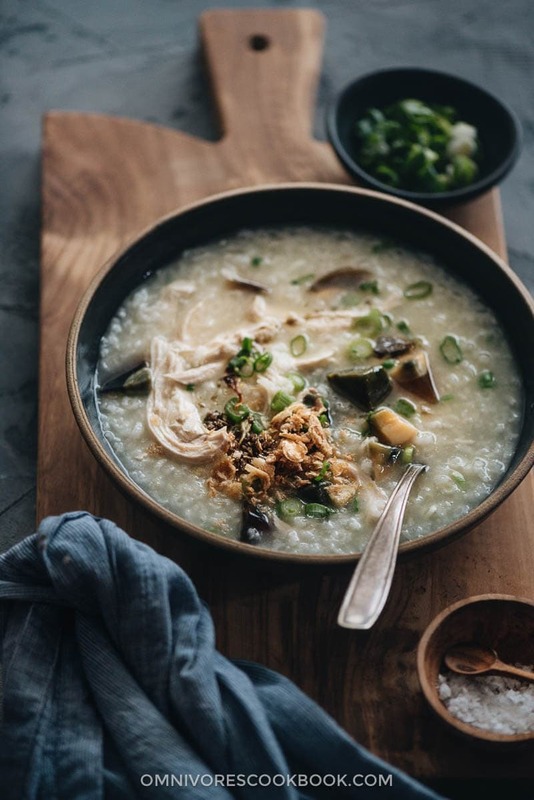 If you want a stickier and thicker congee, remove the chicken first, then keep cooking the congee for another 15 to 20 minutes. Note, the congee will get quite thick and sticky towards the end. Stay nearby the pot and stir frequently. 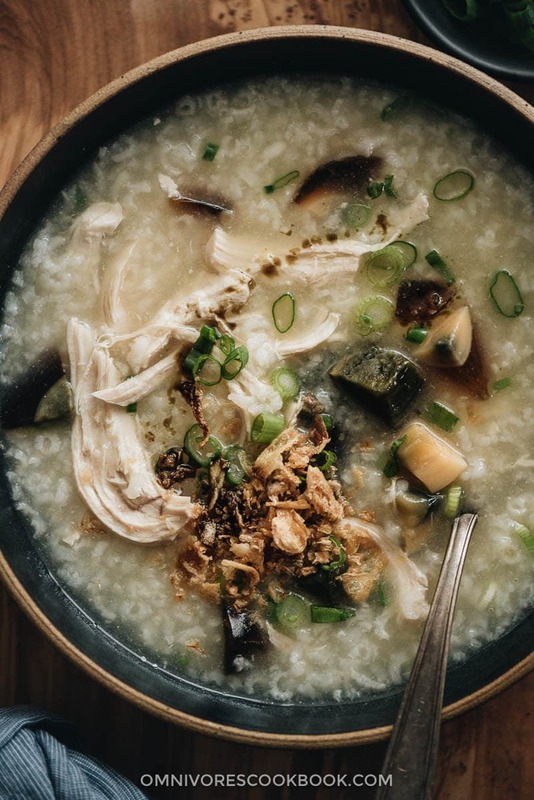 When the congee reaches the desired texture, add back the shredded chicken. Add the century eggs, green onion, and sesame oil (if using) to the pot. Stir to mix well. Taste the congee and add salt to taste if needed. Transfer the congee into small bowls. Top it with a spoonful of fried shallots, if using. Serve hot as a side. 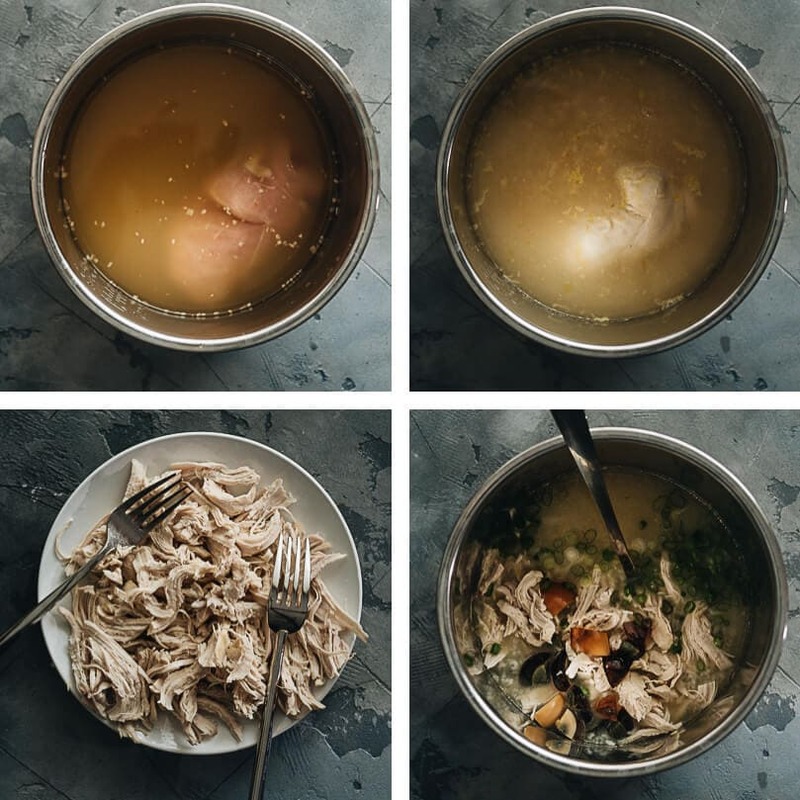 If you cook the dish on the stovetop, you might need a bit more chicken stock, depending on how much liquid evaporates during the cooking process. Frozen chicken only works in the pressure cooker. You should not use frozen chicken if cooking on the stovetop, because the chicken won’t be cooked evenly.